The Republican National Convention began Monday as a cold front moved across Cleveland and brought some rain and thunderstorms during the morning hours. Behind the front, it's making for some pleasant weather across Cleveland and the rest of northeast Ohio during the convention. The heat and humidity may linger on the first day of the RNC, but Tuesday and Wednesday will be nearly perfect with lower humidity and high temperatures near 80 — just a touch below where temperatures usually are in mid-July. However, those enjoyable weather conditions will change as soon as the convention is coming to an end on Thursday. That's when temperatures will be heating up. Highs on Thursday will be in the upper 80s and after everyone is gone on Friday, temperatures climb into the low 90's. Temperatures eventually top out in the mid 90s on Saturday — some of the hottest temperatures northeast Ohio has seen all year! That extra hot air won't be limited to Cleveland and Ohio, either. The entire country is looking a lot more red beginning the second half of this week and into the weekend. 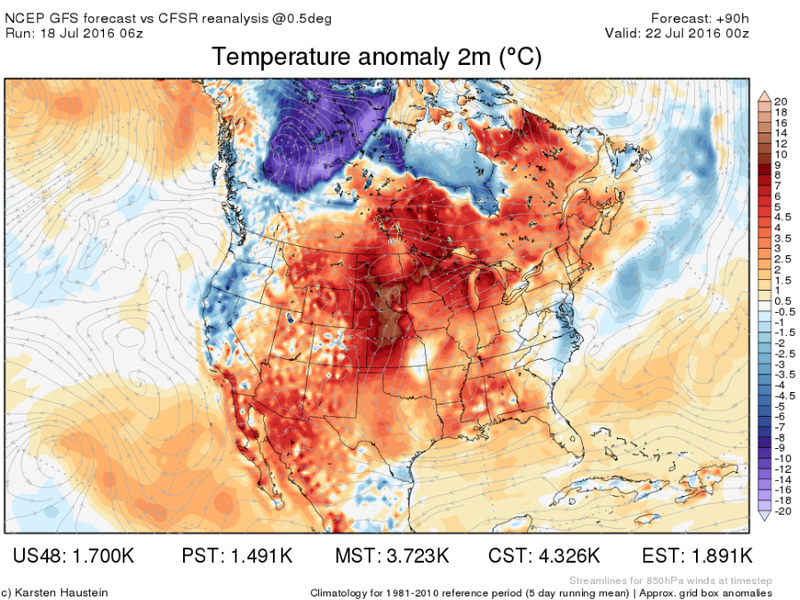 Nearly the entire country will be experiencing above average temperatures thanks to a large area of high pressure over the center of the country that's making way for plentiful sunshine and stagnant air doing nothing but heating up more and more each day. The middle of the country may see some of the hottest air they've seen so far this year. The upside is this heat won't last forever. The high pressure system cooking the country is expected to weaken and break down by the end of the weekend, allowing things to cool down at least a little bit early next week. Though, it probably won't be a big enough cool down to turn the country blue for the Democratic Convention next week.